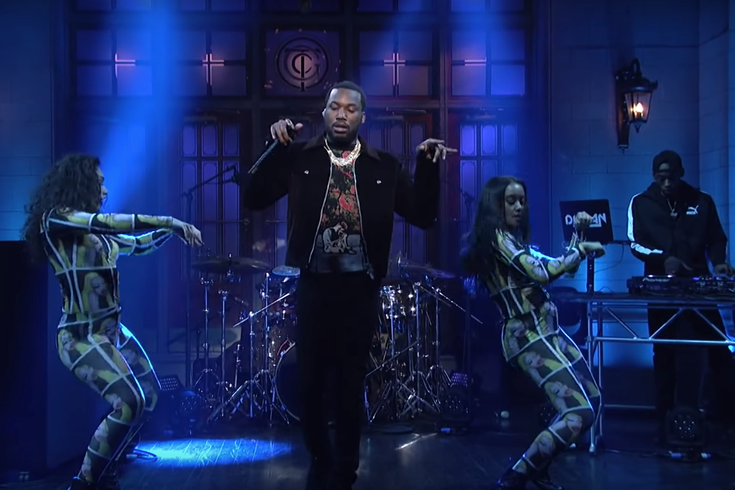 Meek Mill performed some hits off his new album "Championships" during his Jan. 27 performance on "Saturday Night Live." Still riding the success of his newly-released album "Championships," Meek Mill gave a couple of solid performances during "Saturday Night Live" on Jan. 27. Meek made his 30 Rock debute alongside host James McAvoy's first appearance on the show, too. He started out the night with a medley of "Going Bad/Upside" from his album which hit No. 1 on Billboard's top 200 when it dropped Dec. 15. "Going Bad" spent seven weeks on the charts and peaked at No. 6 right after it was released. Fabolous joined the Philly rapper on stage for "Uptown Vibes" and then he finished out the night with a soulful and stripped-down performance of the title track, "Championships." And to top it all off, he gave a special wink to all of us at the end of the performance. "We got Philly in the building!" he said.